On Saturday, March 16th Steamers Restaurant located in Southern Shores, celebrated their 3rd anniversary with a neighborhood open house. Linda Coats and Chris Braswell invited the community to join in celebrating from 1-4pm with complimentary appetizers, drink specials and live music by John Baldwin. As with past years, we were quick to mark our calendars; excited to celebrate a favorite local eatery and Linda and Chris did not disappoint. We arrived a little after 1 and quickly settled into our favorite seats. The appetizers were delicious with fish tacos, beef naan, shrimps n grits and omg how about macaroni and cheese topped with pulled pork, bacon and Steamers famous honey habanero bbq sauce – Mmm is right! It was a great turn out with a number of their devoted Corolla fans making the trek south and we certainly understand why. What a fun day to celebrate such an awesome place. Linda and Chris have been so accommodating to Keller Williams Outer Banks as we hosted a number of meetings this winter at Steamers. Their kindness and love for community continues to show year after year and we are so thankful to have them as part of our Southern Shores bubble. So, thank you, to Steamers and best wishes for many more successful years – cheers! 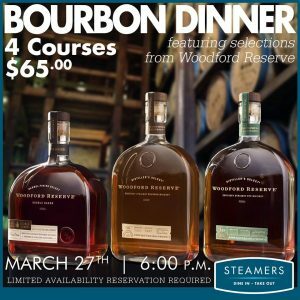 Speaking of cheers, I will be attending my first, 4 course bourbon dinner with Woodford Reserve at Steamers tonight. I’ll make sure to report back!